There are so many different types and brands of dog treats out there that it could be difficult to know where to start and which ones to get based on you or your dog’s needs. Thankfully, here at JugDog HQ we’ve put together a handy list of healthy, natural, training and puppy treats to help you get the right ones. Below is a table with a summary for each category and you can read up on the full review for each treat below. There are a LOT of providers of dog training treats in the UK in 2018 but after testing over 100 treats over a 6 month period we believe the Barker and Barker Little Liver Dog Training Treats are the best overall dog training treats you can buy. They’re healthy, cheap and perfect for day to day use with loads of very positive reviews to back them up from happy dog owners. Please note: These treats are quick treats as opposed to ‘chewing treats’ such as rawhides, bones or indestructible chewing toys etc. When we have researched these treats we will link it here. We’ve split up our best treats for dogs into 4 as mentioned above – best healthy treats, best natural treats, best training treats and puppy treats to help you find the right one. Most treats fit into more than one category so we’ll mention if a treat has more than one use or attribute. These are your every day treats for when you have a good boy/girl with you. Ideal to take out on walks or to reward for general good behaviour. Great to be used as training treats but aren’t specifically designed for it. To be a good healthy treats they need to have: nutritional value, low in calories. Bounce and Bella’s grain free dog treats and nothing short of excellent value for money because in a 500g you get 800 brown bone shaped treats which equates to around 15p per treat. On a typical walk with Jeff we will give him at least 2 treats (start and finish) and perhaps another two during a walk if his behaviour is good, we walk him twice a day so that’s 8 treats a day. That means that this bag will cost you around £12 or 100 days worth of treats. That’s incredible! But anyway, this is a healthy treat so what’s so good about it? Well, the Bounce and Bella treats is a simple treat as it only has 5 ingredients and they’re all health ones. Obviously the treats are grain free as per the name. Sugar and salt are kept to a minimum, and although you still cant give them an unlimited amount it still won’t ruin their appetite even when used with a lengthy training session. The treats are also quite soft so you can break them in half quite easily to turn one treat into two if you have a small dog. Overall, you really can’t go wrong with these treats: you get a staggering 800 in a bag and each and every one is made to precise specifications which are a very tasty, naturally made and healthy treat. TOP QUALITY! If you've been looking for premium dog treats that won't break the bank then your search is over! That's because the only ingredients in our training treats are freshly prepared chicken, duck and turkey meat (80%) and potatoes & chicken gravy (20%) which means a healthier happier doggy - guaranteed! ONLY 5 INGREDIENTS! Fresh chicken, duck & turkey meat (80%), potatoes and chicken gravy (20%). That's it! Nothing else! No additives, no preservatives, no flavourings, no sugars and absolutely no grain (or gluten) to bulk up the food cheaply. This means you can rest easy knowing you're providing the best treats you can buy for your dog. Never let your dog suffer from junk-filled treats again! FREE PDF! 'Training with Treats' emailed shortly after your purchase. Written specifically for you and your dog to thoroughly enjoy your time together bonding over tasty treats and fun training. Stella and Chewy’s entry as a best healthy dog treat is a strong one as they have had rave reviews elsewhere, tick many of our boxes and our own dog loves them. Let’s break this down. These treats are first and foremost a carnivore focused treat which preys on dogs instincts to attract them to eat them, and they do it well as they smell quite strong even for humans so for a dog it must be irresistible. 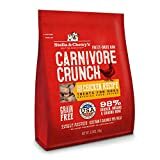 The Carnivore Crunches contain 98% meat and are grain free so you’ll be getting a healthy, natural treat for your dog with these which is a huge plus point, that’s so good human beings would probably enjoy them. Stella and Chewy make it clear that these products are made with responsibly and sustainably sourced and NEVER from China – not sure why they’ve made such a big deal by naming China but not another country I’m not sure but there you go. If you were wondering these treats originate from USA and not the UK – just in case this was a point you cared about. The plus points continue in favour of the carnivore crunch treats as they have no added hormones, antibiotics, grains or fillers. Best of all, it’s 100% complete and balanced for all life stages so these would just as ideal for your puppy as they would for your old timer. They have been minimally processed which is not a worrying point as it’s simply to take the natural ingredients and shape them to the treats you’ll eventually get in the bag. With these treats, you won’t have to worry about any allergies and digestive problems as the ingredients are so pure and there’s no added anything in them. They are super tasty and your dog will do whatever they can to get more of them from you…that includes behaving! The only negative we can think of and this is scraping the barrel is that delivery can be a little slow as they are an import, but that really is nitpicking. We would recommend Carnivore Crunch as a great dog treat all day long. These little gems are low calorie (low carbs and fat) treats (0.3 calories each) and come in a big pot of 400 which makes them excellent every day treats (and training for that matter!) around the house and on a walk. Barker and Barker have also made sure these treats have no cereal or grains included and are made using a compression technique as opposed to being baked. These bad boys are so tasty and healthy they can even be used as a replacement for kibble. Not permanently though as those costs would be through the roof! All in all, the guys are Barker and Barket get the seal of approval from Jug Dog as the best healthy treat for your dog or puppy. Wagg are a pretty well known name the dog treat business and their range of low-fat treats deserves a special mention here. Soft, healthy treats which taste great and come in a convenient resealable pouch and in loads of different flavours. Get Wagg low-fat treats if you’re budget conscious or want to make use of Amazon’s subscription service so you’ve always got treats at hand. 4% fat, oven baked with no added sugar. Not our #1 choice but excellent value for money. Natural or organic dog treats are just that. They are made using natural ingredients free from all or most additives, preservatives and the like. Generally, the natural dog treats are also classed as healthy treats but may not be as low in calories. These treats are usually not designed for intense training sessions due to the usual higher cost. Lily’s Kitchen are a popular brand with us and we’ve featured their scrumptious food in our best wet dog food article and best dry dog foods. We’re also featuring their niche organic bedtime treats here, too. Designed with a good night’s sleep in mind Lily’s Kitchen’s bedtime biscuits contain only natural ingredients which include honey and chamomile and probiotics. They are expensive for what they are but as long as you don’t use them as every day treats and only before bed as a late night fancy treat then your dog will simply love them moorland never get bored. Plus,they will sleep soundly too which can only be a good thing for everyone involved! Suitable for puppy over the age of 4 months and dogs of any age. If you really care about what goes in your dog’s gob then Irish Rover Superfood organic treats are the ones for you. Made in Ireland using only natural ingredients such as kale, chicken and spinach. These treats are almost good enough for humans to eat. Only drawback is the expensive price tag. Judging by the amazon reviews though it would seem dog’s really do love these! To be a good training teat they need to be extra tasty as to truly reward your dog. Another fine feature for a great pack of training treats is a low cost since owners may typically use a lot of them while training, especially during the early weeks and months of a puppy where training is especially critical. Yes it’s Wagg again who have produced a well loved pack of training treats that our own Jug personally loves as do we. 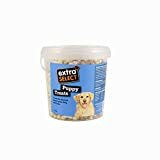 Moist, tasty (we assume) and easy to break into smaller parts for longer training sessions where a lot of treats may be dispensed make these training dog treats an excellent choice. Wagg also provide training treats in a bewildering amount of flavours to suit any mutts tastes. Jeff personally seems to prefer the purple pack below. Also suitable for puppies 8 weeks or over which is the critical time to begin training. For entry level dog training treats you can’t go much wrong with Coachies training treats. These are the treats we started off with as they are so cheap and available from Pet at Home. Does the trick, they are nicely sized and definitely won’t break the bank. To us, they just didn’t quite get our dog as excited as some of the other treats. Puppy treats should have the same attributes as training treats but it helps if they are easier to eat and have needed nutrients and minerals. Having a low cost also helps as you may need a lot of them during the early days. However, we can not stress enough how important it is that you get only good quality treats for a puppy as this time is crucial for their development both mentally (training) and physically (growing). Training should start as soon as your puppy is around 8 weeks old and it will involve a LOT of treats, this is why it’s crucial that don’t cut corners on the quality produce. If you get puppy treats with poor ingredients pumped full of grains then you may get yourself an obese pup and one that isn’t as healthy as they could be. So, with this mind we’ve created a section specifically for our choices of good puppy treats, recommended by us and passes the criteria. 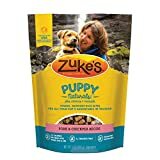 Zuke’s natural puppy treats are perhaps best know in America but you can get the exact same, ultra popular treats over here in the UK, too. These treats tick all of the boxes comfortably by using only natural ingredients including pork, bacon and chickpea. The treats are small, moist and tender (a result of using good ingredients) which is easy to bite and chew for a young puppy without adult teeth. The treats contain protein, DHA & EPA (healthy fats), vitamins (A, C and E) and minerals making them an extremely healthy choice that will contribute to a balanced and healthy diet. Each treat contains approximately 3.5 calories if you wanted to compare with others or if you are calorie counting with your pup. Either way, Zuke’s natural puppy treats are one of Jug Dog’s best choice for puppy treats as they are unbelievable tast, very healthy and at roughly £5 a bag they will not break your bank. Zuke also make adult treats as well if you wanted to progress naturally. Development treats by Pooch and Mutt could be in all 4 categories but best treats for puppies suits them the most. These treats are tasty and ram packed with nutritional goodness that actually helps their development as well as reward them for good behaviour. Slightly on the expensive side to be purely a training aid but an excellent addition alongside our recommended training treats to be used as a higher up reward for truly great behaviour! Pooch and Mutt are also a highly respected company who do things ethical and like to give back which always gets bonus points from JugDog. A cheap and cheerful choice is the extra select puppy treats. Tasty and in small sized bites for little puppy mouths these are an excellent choice. Come in a massive 1l tub (you’re gonna need a lot while training) so you will almost never run out. Usually sells at around £3-£4 so excellent value for money, too. Not the healthiest choice in this list though so make sure to no get carried away or use them conjunction with healthy wet dog food and dry food and healthier treats. Very handy for intense training sessions though. With so many great dog treats around it’s hard to know which is best. It all depends on factors such as your dog’s individual tastes, the purpose of the treat, your dog’s allergies and dietary requirements and of course your budget. Some dogs are in different stages of their lives and in different places with their health, you may also be budget conscious and don’t want to break the bank with something that isn’t their main meal of wet dog food and dry dog food. Also, you might be a bit conscious about what goes into your dog. Treats can be high in calories because of sugar or sweeteners and when used over and over again (like training treats) can really add some weight on your dog. You may also be concerned about additives, preservatives and so on so organic treats may be the ones for you. So, makes a good treat? Obviously it’s important that your dog loves the taste of the treat otherwise it shouldn’t even be called a treat! However, the key is to find a treat that your pooch REALLY loves and their tails wag every time you even make a move toward the packet. Find a treat they love and they’ll do whatever you want! Usually when things taste great its because they’ve got a lot of sugar in them or salt. None of these two are great in large quantities so it’s important to find a pack of treats which have low calories so that they don’t impact greatly on their day to day diet. Dogs can suffer from obesity too. Grains aren’t exactly the devil but they aren’t exactly brilliant either. Look for grain free treats to keep the calories down and give your dogs good carbs instead of empty carbs often found in grains such as corn and wheat. Less processed food is always better for your dog and for a human. Treats made with natural ingredients tend to be more healthy for your dognap their digestion. This is a ‘nice to have’ and not a must have. If you can find dog treats which add to an existing diet and not just as a ‘treat ‘then you’re on to a winner.